The village of Quaqtaq is located on the eastern shore of Diana Bay, called Tuvaaluk (the large ice field) in Inuktitut, on a peninsula which protrudes into the Hudson Strait where it meets Ungava Bay. Mountains stand on the peninsula to the north and to the south-east are short, rocky hills. The region around Diana Bay is rich with land and sea mammals, as well as fish and seafood, including mussels, scallops and clams. Up until the early 1930s, the peninsula was known as Nuvukutaaq (the long point). However, according to stories still told, a man who once came to the area to hunt beluga found live parasites in his faeces. His hunting companions began to call the place Quaqtaq (tapeworm), and the use of this new name spread rapidly. Evidence found nearby shows that different people have occupied the area for about 3500 years. People of the Thule culture, the ancestors of today’s Inuit, arrived around 1400 or 1500 AD. An independent trader built the first trading post in 1927 at Iggiajaaq, a few kilometres south-west of Quaqtaq. It operated for 11 years. At that time, the site of present-day Quaqtaq was one of the Tuvaaluk Inuit’s winter campsites as it was near the limit of land-fast ice. Sea mammals were abundant at this place during the cold season. In 1931, the French fur trading company Révillon Frères opened a second store at Iggiajaaq, which the Hudson’s Bay Company (HBC) assumed control of in 1936. A Baffin Trading Company (BTC) post was established in 1939 in the same area and the following year the HBC closed its post at Iggiajaaq. The BTC post also closed 10 years later at which time the Inuit who normally wintered at Iggiajaaq moved to Quaqtaq. In 1947, a Catholic mission was established at Quaqtaq. Public services were not delivered in the area as early as in other communities. Quaqtaq was considered toosmall. 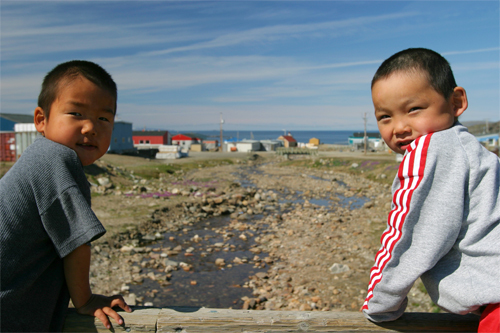 Only after a measles epidemic tore through the area in 1952, killing 11 adults, which is to say 10% of Quaqtaq’s population, did the federal government begin delivering some basic care. A nursing station was built in 1963. In the 1960s, the Quebec government opened a store and a post office equipped with a radio-telephone. In 1974, the store became a co-operative and, in 1978, Quaqtaq was legally established as a Northern village. Akpatok Island, which rises like a fortress out of the waters of Ungava Bay to the east of Quaqtaq, has long been known as the finest area in the region for walrus and polar bear hunting. Moreover, the vertiginous, rocky cliffs that guard the island are the nesting area of a large summer colony of thick-billed murre. Tuvaaluk (Diana Bay): excellent site for hunting and wildlife observation. Numerous archaeological sites scattered throughout the region.